If the Sycamore Library Board needed any confirmation about replacing aging windows in the Carnegie section of the library building; the board got a strong hint after a Jan. 9 meeting when two windows began flapping in 45-mile-per-hour wind gusts. Library director Monica Dombrowski was called to the area by adult services manager, Kim Halsey. The compromised windows were removed and boarded up that night and the scary situation was finally resolved around midnight. But the irony of this occurrence didn’t come as that much of a surprise to Dombrowski. “This unbelievable event is not so unbelievable for windows that are 114 years old,” she said. The original portion of the Sycamore Public Library was built in 1905 with partial funding from the Carnegie Foundation. Today’s fundraising to replace the Carnegie windows has come from local sources, resulting in more than $25,000 so far. Along with the existing window fund, Dombrowski has been working with Sycamore city officials to secure a state grant to offset the window replacement costs. The estimate for replacing the windows could cost between $80,000 and $105,000. If the Sycamore Public Library receives the state grant, work on the windows would need to be completed by June 30. As a proactive approach to help the window project come to fruition, Dombrowski has started a Coins for Carnegie Drive so patrons can donate funds when visiting the library. Additionally, an all-you-can-eat-BBQ dinner fundraiser has been planned by Friends of the Library. 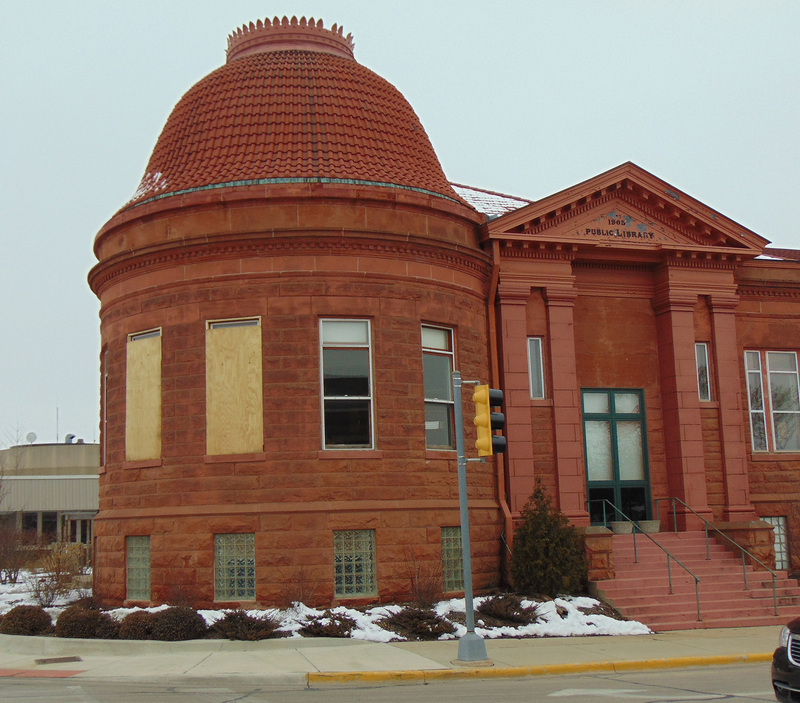 The dinner will take place on Fri., March 1 from 4:00 to 8:00 p.m. at the VFW, 121 S. California St., with all proceeds going to the window replacement fund and other capital improvement projects for the Carnegie section of the library building. Tickets for the dinner can be purchased at the Sycamore Public Library and at the Sycamore Chamber of Commerce office. “The response and the support from the community has been tremendous,” Dombrowski said. “Third ward Alderman Nancy Copple has recently joined our library board and we are very excited to have her help in our fundraising efforts.